Aerotech Laboratories Ltd are UKAS Accredited for conformance checks of NDT materials and consumables used for testing the integrity of metal parts, to American, European and corporate specifications. These checks are carried out on in-service materials including fluorescent dye penetrants, emulsifiers and developers to all major aerospace specifications. Our standard pricing principle is based on a "per sample" cost, irrespective of the number of determinations carried out on that sample. To make the whole process simple we will provide labelled sample bottles included in the price and reports are sent out via email using PDF attachments showing the UKAS logo and authorised signature. Discounts are offered for increased quantities and frequencies. 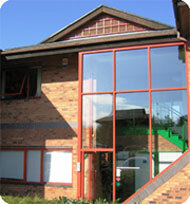 Please contact us to discuss your requirements. So what is NDT using these materials? Dye penetrant inspection (DPI), also called liquid penetrant inspection (LPI), is a widely applied and low-cost inspection method used to locate surface-breaking defects in all non-porous materials (metals, plastics, or ceramics). The process is used to detect casting and forging defects, cracks, and leaks in new products, and fatigue cracks on in-service components. DPI is based upon capillary action, where a low surface tension fluid penetrates into clean and dry surface-breaking discontinuities. Penetrant may be applied to the test component by dipping, spraying, or brushing. 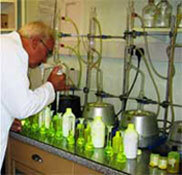 After adequate penetration time has been allowed, the excess penetrant is removed, a developer is applied. The developer helps to draw penetrant out of the flaw where a visible indication becomes visible to the inspector. Inspection is performed under ultraviolet for fluorescent penetrant materials. It is therefore clear that the integrity, quality and performance of the NDT materials used are paramount to the levels of quality that can be achieved when carrying out non-destructive testing. See the Story of the Wheeltappers below. We deliver the Penecert Testing Service in partnership with Magnaflux, a leading supplier of dye penetration inspection chemical products used for non-destructive testing throughout the world. The Penecert Testing Service offered by Magnaflux is provided by Aerotech Laboratories Ltd as the approved testing laboratory. If you purchase your NDT consumables from Magnaflux and would like more information about Penecert please contact us or Magnaflux directly. To explain the role that Aerotech Laboratories Ltd can play in these processes, consider the story of the traditional role of the Wheeltappers. Wheeltappers were highly skilled railwayworkers commonly employed on British railways prior to the 1970s working in goods yards with the hundreds of thousands of goods wagons upon which railways depended for the majority of their income. 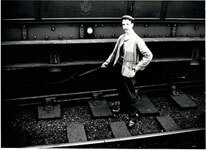 The wheeltapper was employed to check that the wheels on the bogies were sound by using a long handled wheeltapping hammer. He would strike the wheels of the bogie and hear if it rang true whereby a wheel with a crack in it would give off a dull sound. Wheeltappers were vital to the smooth running of the railways as a cracked tyre would lead to delays and the loss of revenue. Equally, in this period, metallurgy was a more haphazard science and thus it was impossible to test steel tyres for cracks, thus the role of the wheeltapper was of crucial importance. But what happens if the Wheeltappers' hammer has got a crack in it??! Every wheel would not ring true; it would appear to be cracked and would need replacing. So, in the modern version of this scenario... We test the hammer! !